Do you host a lot of events on your WordPress site? Or maybe you are planning to do so in the future. Whatever the case is, you will need a reliable event calendar WordPress plugin for your website. The plugin could be used to create and manage small to large scale events like workshops, conferences, seminars, webinars, concerts, parties, get-together etc. Like any other type of plugins, there are lots of WordPress event calendar plugins available. If you haven’t used any such plugin, it could be difficult to find out the most suitable one among them. To make it easier for you, I have collected the 8 best event calendar plugins for WordPress. Go through the list and find out which one meets most of your requirements. 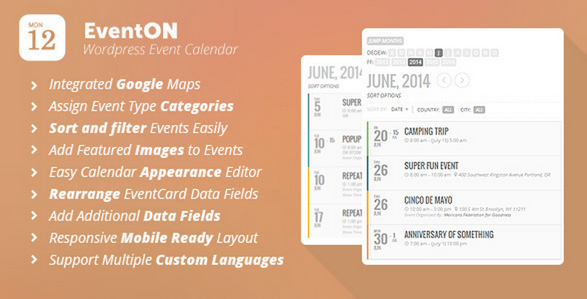 EventOn is the most popular event calendar plugin in CodeCanyon. This powerful plugin is provided with a dedicated shortcode generator and a fully responsive layout. The premium plugin comes with a professional design and an enhanced user experience. The clean tile design option lets you display the calendar in a beautiful grid view. Besides the regular options, the plugin also allows you to add custom color, featured image, Google Maps, event details excerpt, custom meta fields, categories and font icon to the events. You are free to create repeating patterns with any custom pattern. It is possible to display the event list, upcoming events or the event calendar by using the custom widgets. The plugin is priced at $24. If you are looking for a flexible event calendar plugin with timetable view, this premium plugin could be the one for you. By using the custom post type for events, you can create new events within a few minutes. There are several shortcodes and custom widgets available for displaying the events. As the plugin comes with dummy content, you can easily get your event list started by importing them. The simple, beginner-friendly plugin lets you customize the fonts and colors for each event you create. The cross-browser compatible plugin works seamlessly in mobile and tablet devices too. You can use the handy shortcode generator feature to create shortcode for displaying events as timetable. The plugin is priced at $22. The Events Calendar is an excellent free plugin to create and manage custom events in a really simple way. By using the plugin, you can easily create recurring events, public events, ticket-based events etc. WordPress experts like Mark Jaquith and Pippin Williamson have certified the plugin as a reliable and secure tool for creating events. The developers have tested the plugin in high traffic websites and have created lots of events in various patterns. All of these make sure that the plugin will work smoothly in any WordPress site. It also comes with other useful features like list view, Google Maps integration, custom widget, multiple stylesheets, event taxonomy etc. All-in-One Event Calendar is a simple, free WordPress plugin for creating beautiful events. The advanced calendar system of the plugin combines attractive design with dynamic features. As a result, you will get a full-fledged system for creating any type of events. As the plugin comes with full iCal/iCS support, you can import events from other plugins. It is also possible to import events from Google Calendar. If you want to create recurring events with complex patterns, All-in-One Event Calendar has got you covered. You can color code the events according to the categories. Events could be further enhanced by adding featured images. And the calendar theme editor lets you customize the calendar appearance. The plugin is also available in multiple languages. My Calendar is another free event management WordPress plugin with various display options. The WordPress multi-site supported plugin lets you create separate event calendars in different websites of your network. It is possible to display the calendars by the author, location, category or upcoming. While the plugin could be used by any regular WordPress user, expert developers will find lots of customization options for creating a flexible event calendar according to their requirements. WordPress Pro Event Calendar provides a convenient way of adding sleek event calendars in your posts, pages or the sidebar. This plugin allows the registered users of your website to submit their events by using the front-end submission feature. Events could be set as daily, weekly, monthly, yearly or any other custom repeating pattern. Event location could be displayed by using Google Maps. If you want to import events from Facebook, the plugin has got you covered too. Besides Facebook, it is also possible to import events in ics format. If you don’t like the default styling, you can easily change the calendar appearance by applying custom CSS. The plugin also comes with several custom widgets. You can get all these features for only $27. Event Booking Pro is another premium event calendar plugin for WordPress. As it comes with complete PayPal integration, you can easily earn some extra money from your paid events. You can also offer special coupons and discounts for the paid events. The AJAX powered single page admin panel will let you change plugin settings from one convenient location. In order to provide a better user experience, you can categorize the events and provide Google Maps directions. There are several shortcodes available for displaying the calendar, events list, event button etc. It is also possible to send customized email notifications to the participants and events host(s). You can get this plugin with life time free update for only $32. Thanks to the feature-rich event calendar plugins, managing various events in WordPress has never been easier. By using any of the above-mentioned plugins, you can get rid of the mundane event management tasks and focus on making your events more interesting. So, have you decided which plugin suits you the most? Let me know in the comments. And if I have missed any of your favorite event calendar plugin(s), let me know that too. I will be glad to take a look at them. Foysal loves to dig into WordPress, explore what’s possible and share his knowledge with readers. He also has deep interest in anything related to increasing productivity, writing better and being happy! it is very flexible with lot of features and FREE, i am using since 6 months. Hope that it will help other peoples. Thank you very much for your article! Found what I was looking for with WordPress Pro Event Calendar, because it’s possible that Users can create and edit their own events in the Frontend. That’s exactly what I was looking for. Thanks a lot! Hey guys, does any of these plugins allows someone to save the event on the smartphone calendar (google calendar or icloud)? Thanks!